If you’ve been thinking about home renovation, there’s no better time than the present. A 2013 Houzz survey showed that 84% of respondents planned to decorate or redecorate, 40% planned to remodel or build an addition, and 10% were in the process of building a custom home. 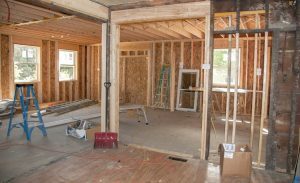 However, many homeowners jump into home renovation without paying attention to the specific building codes that can be violated while remodeling their home. Here are three code violations that are often forgotten during home renovation. According to a study by the National Association of Home Builders, bathroom remodeling is the most requested job in the United States and accounts for 78% of renovations. On average, a bathroom design remodel has an ROI of 63.6%. However, there are a lot of things that need to go into a bathroom to keep it up to code, including the proper amount of ventilation. Ventilation moves the humidity in the air out of your bathroom, which can lead to the growth of mold or rotting wood. To ensure that your bathroom is properly ventilated, humidity should be let out of your house through a 4-inch ventilation pipe. Handrails are used to help people up the stairs, and can be a great way to assist those who have mobility issues in getting up and down the stairs safely. However, there are a set of strict codes that dictate the exact positioning of the handrail. Code states that the ends of a wall-side handrail have to make a 90 degree turn and end at the wall. This is to make sure that the ends of the handrail can’t catch a purse or snag your clothes, which can end up in a tumble otherwise. Smoke detectors are one of the most important pieces of safety equipment and help prevent thousands of deaths. However, just having a smoke alarm is not enough. Smoke alarms are required to be on every floor of the house and should be in each sleeping area and bedroom entry. To ensure they work properly, place them at least 3 feet away from vents, fans, and any lighting fixtures.